The survival of an enterprise often rests upon its ability to make correct and timely decisions, despite the complexity and uncertainty of the environment. Because of the difficulty of employing formal methods in this context, decision makers typically resort to informal methods, sacrificing structure and rigor. SEAS encorporate a new methodology that retains the ease-of-use, familiarity, and (some of) the free-form nature of informal methods, while benefiting from the rigor, structure, and potential for automation characteristic of formal methods. 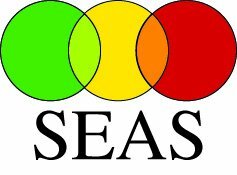 SEAS aims to foster thoughtful and timely analysis through the introduction of structure, and collaboration through access to current and past analytic results. By recording analysts thinking in structured arguments, the results are more comprehensive, more readily understood, and more easily compared. By providing access to a corporate memory of analytic methods and results, analysts can work together on common arguments and leverage historical results. The structured argumentation methodology encourages a careful analysis, by reminding the analyst of the full spectrum of indicators to be considered. It also eases argument comprehension by allowing the analyst or decision maker to "drill down" along the component lines of reasoning to discover the basis and rationale of others arguments, and it invites and facilitates argument comparison by framing arguments within common structures.